In a large bowl, mix together the egg yolk, mustard, tomato paste, salt and pepper. Using an electric whisk stir up the mixture by adding the oil little by little until you have a sauce not too firm. Add the cognac and vinegar and beat again to add everything to the sauce. Cover and reserve in the fridge until serving time. Decorticate your shrimp tails and devein them. In a bowl mix the shrimps with salt and pepper. Thread the shrimp by spacing them a little on the skewers. At this stage we can do 2 cooking method either at the grill or in the pan. For grilling heat your grill and place your shrimp skewers on the grill. Let grill 5 minutes on one side and 3 minutes on the other side and it is ready. For pan cooking heat a pan with a little olive oil and put the shrimp skewers. Cook 5 minutes on one side and 5 minutes on the other it is ready. To serve cut the pineapple in 2 and empty the center a little so that you can put the sauce. 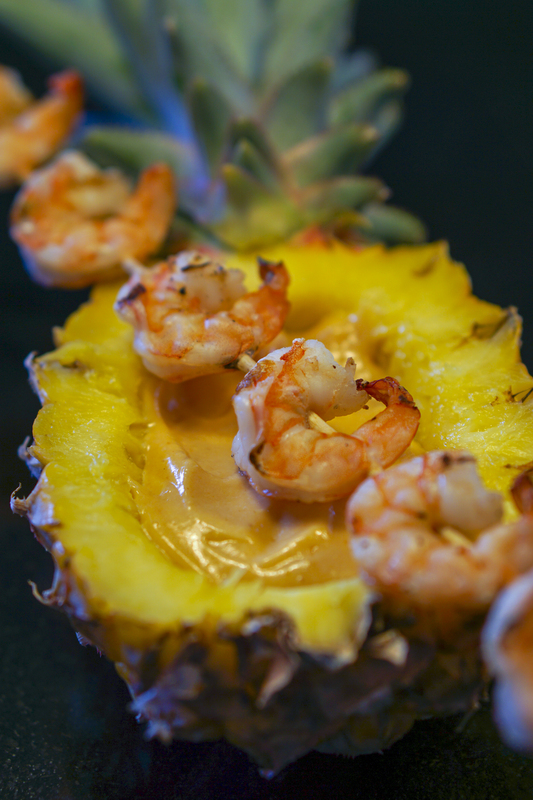 Pour the sauce into the pineapple, put the shrimp skewers on it and enjoy your shrimp with cocktail sauce. You can also use this sauce to eat with pieces of raw vegetables (carrot stick, cucumber, celery branch etc.) as a gajack.